Concert halls are an important and increasingly popular part of arts and leisure culture where cutting edge technologies are used to provide the best possible acoustics for the music and theatre to be performed. They tend to be constructed in urban environments to allow accessibility which can lead to challenging scenarios where externally induced noise and vibration from road, rail, general urban noise and tightly spaced venues can dramatically affect the critical acoustic experience. 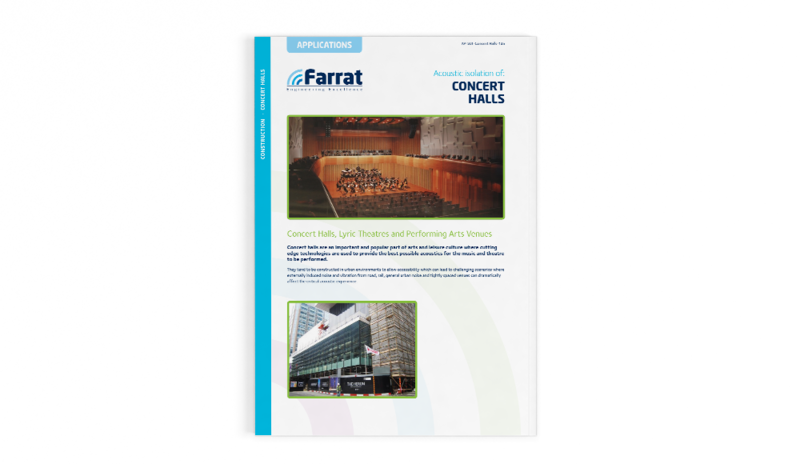 Which Farrat solution is most suitable for acoustic isolation of Concert Halls? Farrat can help in overcoming these challenges. From outline design all the way through to installation, we have the multi-disciplined knowledge and capabilities in place to assist the entire design team. We provide detail advice and specification assistance drawing on our wide portfolio of High Performance Sound Insulation products and solutions, as well as a highly trained installation team, which enables us to deliver a fully guaranteed package.